Mark Waid’s return to Captain America takes the name of Marvel’s Legacy initiative to heart, exploring the hero’s place in the present before jumping to the future to show how his legacy withstands the test of time. Steve Rogers previously joined a team of rebels to defeat a despot that had taken over the United States, and in Waid’s final storyline, he’s taken Rogers off the board to explore how one of his descendants fares in a world that has used the Super Soldier Serum to create a (seemingly) utopian society. There, Jack Rogers stumbles onto a secret that changes everything, and becomes public enemy #1 after learning that the serum is actually turning people into sleeper agents for the alien Kree empire. To make matters worse, he’s just inadvertently freed Captain America’s archnemesis Red Skull from his Cosmic Cube prison, unleashing one of history’s most despicable villains on a future that doesn’t have Captain America to protect it. 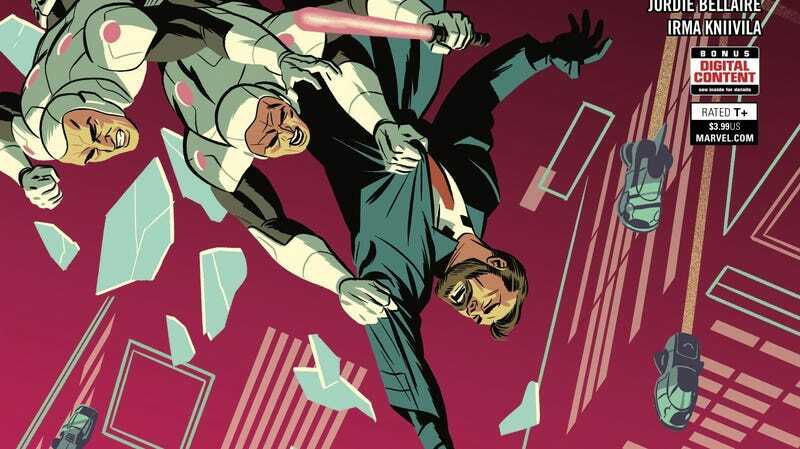 Waid has had phenomenal art teams on this series, starting his run with frequent collaborators Chris Samnee and Matthew Wilson before working with artist Leonardo Romero, colorist Jordie Bellaire, and a slew of big-name guests for this last arc. This exclusive preview of next week’s Captain America #703 spotlights Romero and Bellaire’s exceptional control of mood and atmosphere, beginning with a foreboding scene of Jack’s son being taken away before shifting to explosive action when Jack is attacked by the Red Skull. Romero fully embraces Jack Kirby’s style for his depiction of the villain, intensifying the drama of his return. This excerpt also includes a page by superhero legend Alan Davis, who works with inker Mark Farmer and colorist Irma Kniivila to fill in the blanks regarding Steve Rogers’ past. This run on Captain America has been gorgeous, and the artwork has consistently energized and elevated Waid’s writing.